residue. The amount of residue left is based on how much cleaning product was applied to the spot and how good of a job the consumer did trying to remove the cleaner after application. The problem is that the residue left on the carpet will then attract dirt. Also, some of the store bought cleaning products can utilize harsh products to address spot removal. If these type cleaners do not remove the spot, they tend to make it a permanent stain. So what do you do? First, removal of the initial insult is top of the list. 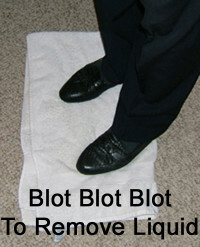 For liquid spills, use a dry clean white cloth or towel. Put it on the spill and apply pressure. The liquid will migrate from the carpet/rug onto the towel. Keep moving the towel so a dry area is over the spill and keep this up until no more liquid is transferred to the towel. For any solid particles, scrap them off with a spoon or dull object.